1) I have a defined benefit pension and will need to decide if I want to take the pension or lump sum at some point. I explained my current plan is to take the pension since it provides me more diversification (1 fixed income steam, and 401K withdrawals) vs managing one large lump sum. I was pleasantly surprised that the adviser agreed with my plan vs trying to maximize AUM for a bigger fee. 2) He then showed me the results of their analysis using their proprietary program which is just a fancier version of i-ORP. Surprisingly it recommended pulling money out of Roth accounts in the first few years. I told him I understood Roth money was the last thing you want to spend down since it grows tax free. He explained that pulling money out of Roth accounts allows one to keep your tax rate down and anytime you can defer taxes its a good thing. His proposal had me in the 12% bracket for the first few several years, then my tax rate went to 22% and then 24% after RMDs kick in. Incidentally, their program uses current tax laws from start of retirement till my spouse and I both die - no option to revert to 2017 and prior tax laws after 2025. My question is does it ever make sense to spend down Roth accounts early in retirement to defer taxes?? Thanks. yes, for my father, we used roth/taxable assets to spend for a couple years in retirement, so that he could get larger ACA subsidies AND so that he could get a low income tax break on his property taxes. If you are in the 22%/24% brackets once RMD's kick in it likely means that much, if not all, of your Social Security income will be taxed up to the 85% maximum. In the 22% bracket that means that some of your SS dollars MAY be result in a marginal rate of 40.7% for each additional dollar taken in RMD's and in the 24% bracket that the marginal rate of 44.4%. Drawing down your IRA's rather than your Roth (and possibly doing Roth conversions) prior to starting Social Security MAY be a better approach to managing your tax liability across all of your retirement as it reduces your forced withdrawals. Our current plan will be that our Roth funds will be the last spent or that they will be strategically used post age 70 if needed for specific needs, purchases, or splurges. You do also have to take into account your estate planning situation if you expect to leave a large estate to your heirs. Your heirs are best off with an Inherited Roth IRA, followed by a taxable account with stepped up cost basis, qualified dividends, and preferential long term capital gains taxes, and then an Inherited Traditional IRA that they will have to take RMDs from for many years taxed as ordinary income. Part of the decision basically becomes do you want to pre pay tax for your heirs or do you want them to let them take care of it? Another factor is traditional to roth conversions. Some people plan to convert traditional retirement accounts to roths before RMDs start. If you withdraw from the Roth in your 60s at the same time you are converting from Traditional to Roth you are essentially drawing down your Traditional account by paying taxes on it when you are in a lower tax rate. In your case I'd look into this since you expect to be in a low tax rate for a few years. Then don't forget about qualified charitable distributions for your RMDs. 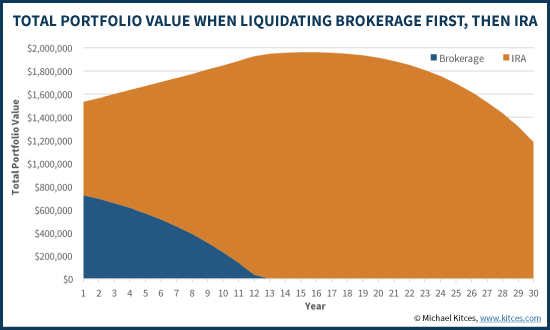 Perhaps by then you will even be able to put the QCD into a Donor Advised Fund. This option will significantly reduce or eliminate tax on RMDs for a few years in their early 70s. Maybe their model takes this into account but don't forget about the dividends generating cash in your taxable accounts. Great overall reply but you CANNOT put QCDs into a Donor Advised Fund. Is Vanguard Charitable eligible to receive a QCD? While we would love to offer our donors the ability to distribute their RMD tax-free to Vanguard Charitable, federal law does not allow donor-advised funds to accept QCDs. This is because the Pension Protection Act, which established QCDs in 2006, limited them to operating charities. For this reason, donor-advised funds, private non-operating foundations, and supporting organizations are ineligible to accept QCDs. A direct IRA distribution to a donor-advised fund is therefore treated as a taxable withdrawal from your IRA, which may qualify for an offsetting charitable deduction. While there has been some discussion in Congress about allowing donor-advised funds to receive QCDs, no changes have been made to date. He explained that pulling money out of Roth accounts allows one to keep your tax rate down and anytime you can defer taxes its a good thing. His proposal had me in the 12% bracket for the first few several years, then my tax rate went to 22% and then 24% after RMDs kick in. Without doing any detailed analysis, I don't see how it can be better to defer taxes when they would be 12% now and 22% later. Also if it is always better to defer taxes, no one should be using a Roth instead of traditional in the first place. I am currently doing Roth conversions to the top of the 12% bracket now, because otherwise me, my surviving spouse, or my heirs will most likely be paying 22% (and almost certainly at least 12%) in order to use that money. 2) He then showed me the results of their analysis using their proprietary program which is just a fancier version of i-ORP. Just curious: Have you checked I-ORP to see if it corroborates that analysis? I suggest looking at Roth conversions as part of the strategy, rather than straight withdrawals. If you need $1K/month income, you can convert $12K in January, make quarterly tax payments, withdraw $1K/month, and get all of the earnings to accrue in the tax-free account. Over time, you'll come out ahead on taxes, even if you don't convert up to the bracket top. You should also consider additional conversions to optimize longer term tax impacts. You cannot right now, correct, but that's why I used future tense and wrote maybe by the time you take your RMDs it will be possible to put the QCD into a DAF. Guilty of not taking a few more seconds to clarify you can't do it now. If I was well under 70.5 I'd be thinking there's a reasonable chance it will be possible to do it. Of course I won't speculate about the details of future laws on this forum. Last edited by stan1 on Sat Nov 17, 2018 12:41 pm, edited 1 time in total. But that would be the same thing as spending from the tax deferred account. If I convert $12K and then spend $12K from Roth, I end up in exactly the same place as if I just spent $12K from the tax deferred account. The OP's advisor claims that the Roth should be used before the tax-deferred. (I disagree, but I don't think the advisor would say spend from Roth and simultaneously convert the same amount to Roth, and if they did suggest that, then that would be even stranger). I would assume greater conversions than drawdown with the lower tax rate but depends on individual circumstances. I would be very hesitant to fully accept a proprietary program from someone who could/would profit from the results. To avoid RMDs, how hard it is to get a job that offers a 401K, and then rollover all kinds of 401K-compatible funds into that? My understanding is that a 401K from current employer is not subject to RMDs. If you want to work forever it’s probably a workable strategy. Once you you stop the RMDs are just going to be all the larger. Not exactly. The taxable income in a given year would be the same -- the amount removed from the tax deferred account. However, this would shift the earnings on the unspent part of that withdrawal to a tax-free account. Over time, that adds up. Unless you were an egregious over-saver into tax-deferred accounts, RMDs are unlikely to be a real problem. Assuming 4% withdrawals, you need $600k of tax-deferred assets just to fill the 0% bracket for a married filing jointly couple. You need about $2.5 million to fill up the 12% bracket for MFJ. Yes, Social Security benefits reduce these amounts, but the point remains that you need a lot of tax-deferred assets to run into a real problem. If possible, the generally recommended strategy is to do Roth conversions before the RMDs kick in. I plan to retire no later than age 55, and that will give us 15 years to do Roth conversions, although we will only do so up to the top of the 12% bracket. That's a great post by Kitces. Three of his graphs should be shown here. Not necessarily the OP's situation, but there could be a few situations where spending from a Roth first makes sense. 1. Retirement before age 59.5 and withdrawing contributions from a Roth to avoid withdrawal penalties from a tax deferred account. 2. It may be the right approach if one has low living costs and wants to avoid some (or all ) taxation of SS benefits as well as qualifying for ACA subsidies. For the OP, I agree with others that Roth conversions and an overall leveling of tax liability may be a better approach. Hard to know without all the details. you need $600k of tax-deferred assets just to fill the 0% bracket for a married filing jointly couple. You need about $2.5 million to fill up the 12% bracket for MFJ. Yes, Social Security benefits reduce these amounts, but the point remains that you need a lot of tax-deferred assets to run into a real problem. Well, we are 40, and we already have nearly $900K in 401Ks. If we keep at this pace, and starting 50, use the catch-up too, I am sure we will hit $2MM in 401Ks. Not to mention that we will probably have $10MM or more in total assets. Assets outside of 401K will be at a minimum generating dividends at 2%, so that's probably around $150K. So, yea, adding another $100K on top of that would definitely be a lot of taxes. Not to mention that if SS is still alive, we would probably get around $50K in SS income. 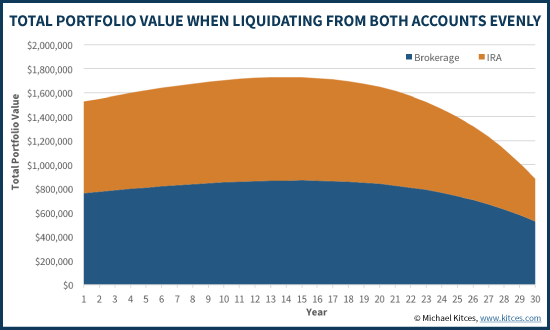 If only 20% of your net assets will be in tax-deferred accounts, then it doesn't seem that you're likely to have an RMD problem. Yes, they may nudge you into a slightly higher tax bracket in your instance, but that doesn't seem likely to cause you a real problem, especially with $10 million or more in assets. First world problems. Just saying. 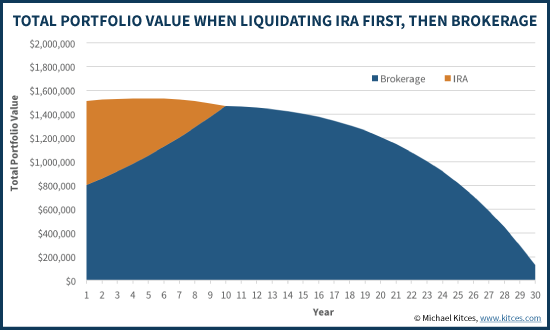 If we assume the IRA is tax-deferred (not Roth) and subject to higher taxes, because it has no basis and or capital gains, then how would those charts look as a matter of after-tax income? Those charts are for traditional (tax-deferred) IRAs. The last chart would actually result in the greatest level of after-tax wealth. Thanks for the comments. I think I'll follow the approach outlined by Kitces. That was my plan too. Retire at 55 and do conversions. However, employer had other idea. Merger had me leave at age 48 so I didn't qualify for medical retirement benefits. Still retired at age 56 at the start of ACA but with ACA you need to keep your income low if you want the subsidies. No ROTH conversions. Plan B calls for me to wait until age 65, get Medicare and then start conversions well into my 70's. Part of my plan B was to use just enough tax deferred to qualify for max subsidy and then use ROTH for all other expenses. Interesting situation. How does taxable fit into this? Can you take out taxable accounts at 0% capital gains? I was planning on some of that along with Roth conversions as folks have talked about here. Then, I always thought it was taxable first before Roth, but this has me thinking it depends. Also, I expect my Roth to be my emergency funds during those transition years, so I will be spending my emergency funds during that time and shifting the role to the Roth funds. I have always left Roth to be the last account to be tapped, but this has me thinking if that's not always the best. Still, I'm not seeing the benefit of spending Roth first (or earlier) for me yet.